Are you ready to become a first time home owner? We'll go over some first time home buyer tips to help you get there. Finding an appropriate home may be challenging, but there’s much more to examine. You’ve got to come up with a down payment, get qualified for a home loan, consider closing costs, and much more. For the first time home buyer this may seem daunting, so we’ve put together some tips to provide you with every advantage when it comes to buying your first home. The first things you need to consider before pursuing your first home purchase is what you’ll be able to afford. You need to find out what your total monthly housing expenses will be. A mortgage calculator is a great way to determine what you can afford on a monthly basis. But you’ll want to consider the additional costs associated with home ownership. You’ll need to include property taxes, home insurance, escrow, and miscellaneous closing costs. These can add considerably to your monthly outlay. Property taxes can be determined by checking with your local government, as these vary greatly from state to state. 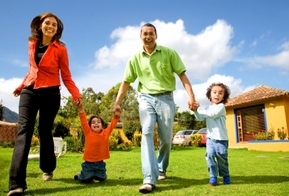 Getting a home insurance quote is a simple way to determine those costs, and save as well. Closing costs vary, but they can often be negotiated with your lender. Be sure to account for Private Mortgage Insurance (PMI) if you plan on making a down payment less than the standard 20 percent (you can cancel PMI later). The important thing here is to get an idea of what your total expenses will be. Most experts will recommend that your total monthly housing costs not exceed 28 percent of your gross income. When shopping for a home loan you’ll want to consider the government funded first time home owner programs. These often offer lower interest rates and lower down payment requirements, when compared with conventional mortgage loans. Both government-sponsored organizations, Fannie Mae and Freddie Mac offer first time home buyer mortgage programs. They don’t lend directly to the public; rather they guarantee the underlying mortgage loans through approved lenders. Without these organizations, many first time home owners would be out of luck. Fannie and Freddie are especially popular for their first time home buyer low down payment programs. These loans can be had for as little as a 3 percent down. Though in Fannie Mae’s case, a larger down payment of 5% allows for loan approval on smaller salaries. Loan limits have temporarily increased to as high as $729,000 in high-cost areas from $417,000. The Federal Housing Administration (FHA) insures loans for certain approved lenders. There are a number of programs, but they typically offer low down payment loans, lower closing costs, and easier credit qualifying when compared to traditional mortgages. Much like Fannie Mae they do have their limits, however. You can check the current limits based on your area by going to the FHA limit page. If you have credit issues a FHA loan may be just what you’re looking for. Amazingly, you may be approved for a FHA home loan even if you’ve had major financial issues in the past. Lower credit scores qualify when compared to conventional mortgages. Bankruptcy or foreclosure isn’t a cause for discrimination with the FHA. You may qualify with either, assuming you’ve maintained good credit for two to three years after the occurrence. Housing and Urban Development (HUD) offers many programs and grants. First time home buyer grants and programs can be found on HUD’s website by searching your region. Before applying for a particular program make sure you qualify and understand the guidelines. Some states may require repayment upon future sale of the home, for example. If you have a good credit rating and income you may qualify for a more attractive conventional type loan. Be sure to do your homework and compare all your options. An Adjustable Rate Mortgage (ARM), for example, may offer lower monthly payments initially, but there are certain risks that need to be considered. Unfortunately, for some, the recent housing downturn is currently exposing these risks. Home buyers who are applying for home loans are best served to do so with a good credit rating, and first time home buyers are no exception. Borrowers with higher credit scores pose less risk to lenders, and are rewarded with lower interest rate loans as a result. Your credit score will have a considerable impact on how much you’ll have to pay. Checking your credit report for issues or mistakes is a prudent step in the home buying process. Credit repair can only be completed if you’re aware of any issues on your credit report. You can check and address any issues rather easily by getting a free credit report online. -You must be a first time home buyer to receive the $7,500 tax credit. -First time home buyer’s are defined as a buyer who hasn’t owned a home in the past three years. -You must be a U.S. Citizen. -Designed as a stimulus this is a temporary tax credit with a short-term window of opportunity. As a result the sale must close between April 9, 2008 and June 30, 2009 in order to receive the tax credit. -In order to receive the full $7,500 tax credit your adjusted gross income (AGI) must not exceed $75,000 if you’re single or head-of-household. -Single or head-of-household homebuyers who earn between $75,000 and $95,000 are eligible for a partial tax credit. -Married couples who file joint tax returns are limited to a total income of $150,000. -Married couples who earn between $150,000 and $170,000 are eligible for a partial tax credit. -Single taxpayers with AGI in excess of the $95,000 and married couples with an AGI in excess of the $170,000 are not eligible for the first time home buyer tax credit. -The tax credit must be paid back. It’s more like an interest free loan that must be paid back over a 15-year period. -You must start paying back the loan within 2 years of claiming the credit. A home purchaser utilizing the $7,500 credit, for example, would repay the credit in 15 equal installments of $500 a year. Essentially, the homeowner would owe an additional $500 in taxes each year. -Upon the sale of the home, any remaining credit is due from profits. Thanks to the Taxpayer Relief Act of 1997 you can withdrawal Individual Retirement Account (IRA) fundspenalty free when used for a first time home purchase/expenses. Typically, early IRA withdrawal will incur a penalty of 10 percent when withdrawn prior to age 59 ½. First time home Buyers can forego these penalties when buying their first home. You can withdrawal up to $10,000 without penalty. This $10,000 limit is a lifetime limit, and can only be used once. It’s important to keep in mind that you will be required to pay taxes on traditional IRA withdrawals. Due to the tax-free nature of Roth IRA’s, withdrawals from these accounts are free from tax and penalty. Early withdrawal rules for the Roth IRA differ from their traditional counterparts in that the Roth account must be held for 5 years. You don’t necessarily have to be buying your first home to take advantage of the penalty free withdrawal. The IRS defines first time home buyers as those who haven’t owned a principle residence in the past 2 years. Moreover, this can be utilized for you, your spouse, your children, your grandchildren or even your parents. Becoming a first time home buyer may seem a bit intimidating these days. Utilizing the tools available to you along with some strategic planning can help you get there. It’s all worth it, of course, as there’s nothing like being a first time home owner. Is a Prepaid Legal Service Plan Right for You?